← Want help with mind mapping and using MindManager in your organisation? One especially useful feature of the current version of MindManager (MM2019) is the way in which the program’s latest features can work with each other as well as with MM’s more established features to produce new ways of seeing, managing, and presenting material in mind maps. In this series I will look at some of these integrations, starting with how the revamped SmartRules feature can be used to translate tags and icons, including task icons, into topic properties which can then be used with MM’s Formula facility. The primary purpose of this integration is to provide a dynamic count at the central or parent topic level of specific tags or icons in the relevant descendant sub-topics. MM has long had the facility to count tags and icons in the Marker Index, but these are global counts across either the whole or filtered map and aren’t easily accessible within the map itself. Sometimes it’s more useful to show the total count directly in the map, especially if you can show it on a branch-by-branch basis. The ability to count tags and icons with a map also opens up a range of other possibilities. These counts can be used in other formulas or to apply specific tags or formatting to the parent topic; for example, you can use this approach to apply and then count tags for specific defects in a project, or each time a particular comment is made in a survey at the sub-topic level. Alternatively, a special tag could be added to the parent topic depending on the result, or it could be specially formatted to highlight key issues. This facility can even be used as a basis for constructing Boolean If-Then-Else statements which currently are not available in formulas. I’ll explore some variations on this approach and other potential uses in later articles. The process is reasonably straightforward, providing you have a basic understanding of MM2019’s Topic Properties, SmartRules and Formulas – and of course, tags and icons. If you haven’t used these features before try to have a little play with them first. In this example I’m using the default Kanban “To Do”, “Doing” and “Done” tag group but you could use any tag group or icon set. It’s probably best to start with a group containing a limited number of tags or icons set to mutually exclusive, though you can use more complex groups and ones which are not constrained this way (though there are some issues which I’ll cover later). I’m also using a simple map and adding the count totals to the central topic, but the same approach can be used to show the totals for each branch at the parent topic level. 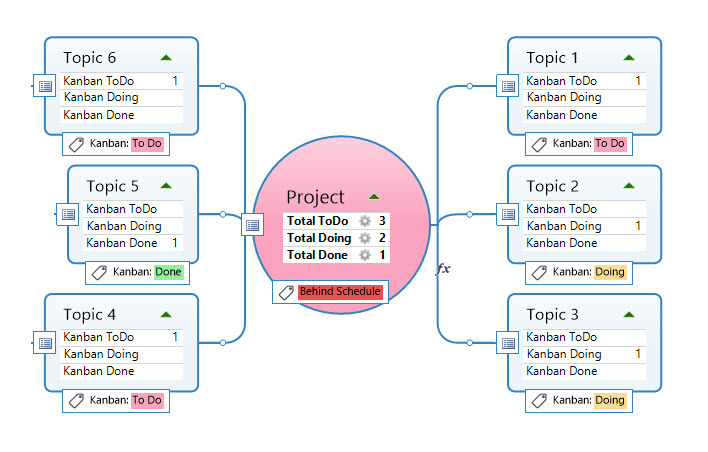 Apply one of the Kanban “To Do”, “Doing” and “Done” tags as appropriate to each of the task sub-topics in the map. 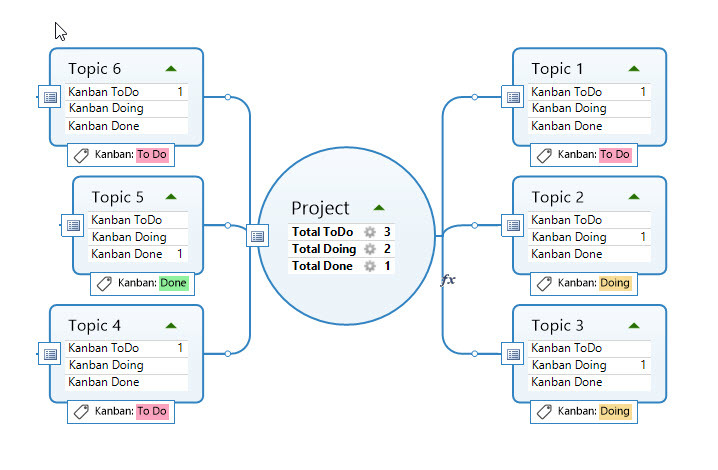 Select a task sub-topic and create a separate numeric topic property for each Kanban tag named, for example, “Kanban To Do”, “Kanban Doing” and “Kanban Done”. Copy and paste the complete set of properties to every task sub-topic. Create and name a SmartRule that adds the number 1 to each task property to reflect the sub-topic’s current status. For example, the Kanban “Doing” tag becomes the trigger and the effect is to add the number 1 to the “Kanban Doing” topic property. Each tag will require its own SmartRule, so in this case you will need to create a SmartRule for each of the other tags, in this case, “To Do” and “Done”. If the SmartRules are set up properly then each task sub-topic should have the number “1” showing only in the topic property that is the equivalent of its Kanban tag (and nothing in the other properties). Write the following formula in the central topic for each of these Kanban topic properties, changing the property names as appropriate: [Total ToDo]=SUM(Descendants[Kanban ToDo]). 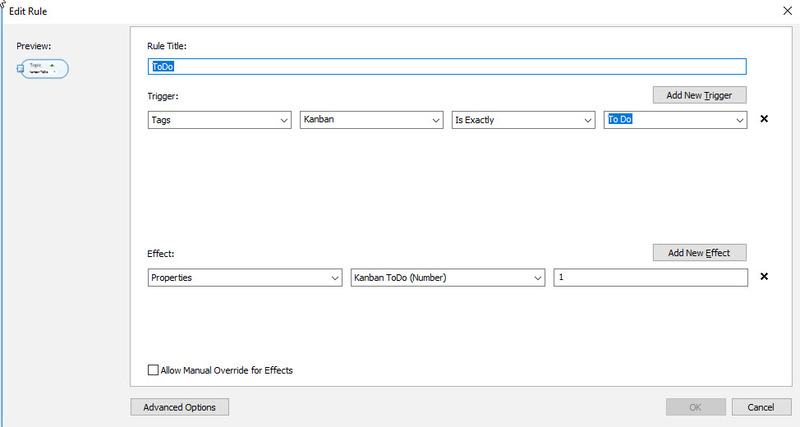 You also need formulas to sum the “Kanban Doing” and “Kanban Done” properties. If the formulas have been written correctly, a calculated property totalling the number of each Kanban tag (and, consequently, the number of task sub-topics with that Kanban tag) should now appear in the central topic. The same approach can be used with all text tags and all icons including task-related ones, as well as resources. If you have the MAP add-in, you can create topic properties directly from some task-related markers (and some non-task-related topic attributes as well, such as topic level) without needing to use SmartRules, which in effect means that you can skip from Step 1 to Step 4 in the instructions above. How do I highlight specific tag and icon count totals? The basic process for highlighting central or parent topics to show where the count of Kanban or other tags (or icons) meets or does not meet certain parameters is very simple. Create a SmartRule where the relevant topic property is the basis for the trigger and add the relevant parameter – for example, if the total number of the tasks with the Kanban “To Do” tag equals or exceeds three, the SmartRule could add a special fill colour to the central topic. A specific icon, or a text tag with a name like “Behind Schedule”, can also be added or used as an alternative to topic formatting. You can also set up additional SmartRules to show different status levels based on a numeric range, for example, if there is only one task or none at all with the Kanban “To Do” tag you could add a SmartRule to show an “On Track” tag on the central topic by setting up a rule with a trigger based on the count of less than or equal to one. If there are two tasks with the “To Do” tag you could add a SmartRule to show a “At Risk” tag based on a count of equal to two. By doing this you are effectively setting up a series of If-Then-Else statements at the central topic based on tag count properties. You can use this process to show text statements based on status as in this example, or to show a number which in turn can be used in other formulas. You can also apply this approach at the main topic level or even with individual sub-topics. Another tip: this approach can be used to show status levels based on the count or total at the central topic (or parent topic) of any numeric topic property shown in sub-topics in the map, and not just those created by SmartRules linked to tags or icons. Are there any issues or limitations? The main thing to remember is that every time a tag is added to the group being counted a separate topic property has to be created, along with an associated SmartRule and formula. 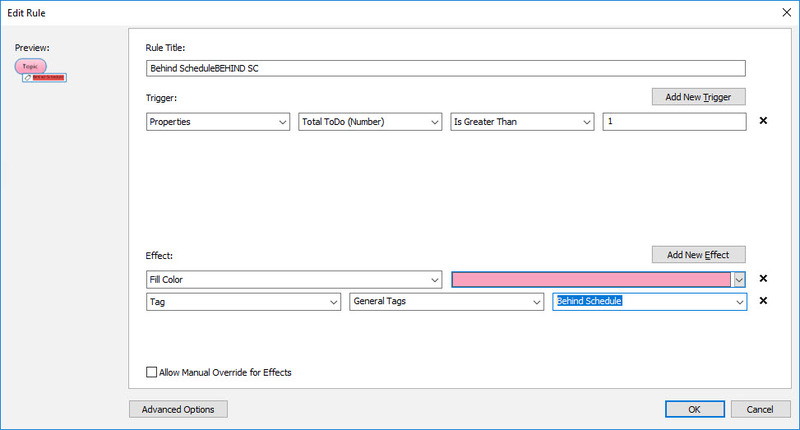 Similarly, if a tag is amended the SmartRule and formula linked to it have to be edited to reflect the changes, while SmartRules and formulas should be removed when the tags they are linked to are deleted. Obviously, you can apply only one effect of each type at a time to the central topic to reflect total tag or icon counts, so if you want to track multiple tag totals you will need to plan how this will work to avoid confusion. In theory you can link the counts of different tags or icons mathematically using formulas and then apply an effect based on the result, but this will need some very careful thinking to set up properly. Finally, the usual caveats apply to the use of SmartRules – any effects applied are transient and the SmartRule needs to be turned on for them to appear. Also, any sub-topic to which the Ignore SmartRules option has been applied, or which is hidden by filtering, will not be counted in the total. In the next part in this series I’ll explore some of the more complex applications of SmartRules and Formulas integration. This entry was posted in MM2019, Viewing, Filtering and Formatting and tagged Filtering, Formatting, Mind Mapping, MindManager, MM2019, Project Management. Bookmark the permalink. This is excellent, Alex. I tried it and it works quite nicely. Great approach for my complex project dashboards especially with SAP projects. Thanks – I’m glad you found it useful. By the way, did you get the website you mentioned in your comment a few weeks ago up and running?